The Catalan donkey is regarded as the unofficial national symbol of Catalonia, which competes with the massive Spanish bull. Within the bull the Catalans see a concentrated symbol of Spain’s power, whereas the donkey, as a peaceful but strong-willed symbol is more a reflection of their own disposition. This symbolizes the desired independence of the Catalans and embodies two parallel primal Catalan features: strong willed and ambitious. 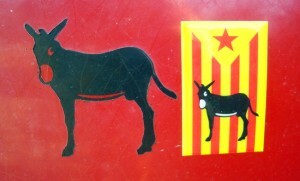 In the year 2000 the graphical designer Eloi-Allegre designed the original symbol of the Catalan donkey. In 2004, Jaume Sala and Àlex Ferreiro developed a second, slightly modified version. The donkey is omnipresent. He is emblazoned on car stickers, adorns bath towels, caps, T- shirts or coffee mugs. In reality, the Catalan donkey is one of the oldest and largest donkey breeds. He has his origins here in Catalonia and the Pyrenees. They used to be a part of the streetscape with a herd of up to 50,000 animals. Today there are only about 500 pure-bred animals left. The “Burro Català” or “Ruc Català” reaches a shoulder height of up to 1.65 meters. He is dark brown and has a, for many donkeys typical, white flour mouth and a white belly.